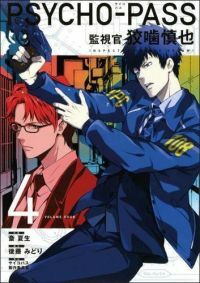 From Star Creator Gen Urobuch (Fate/Zero, Puella Magi Madoka Magica) comes the fourth volume in the manga prequel to the hit anime series Psycho-Pass! The perfect society and its price...the manga prequel to the acclaimed anime series! In the 22nd century, the Psycho-Pass measures emotional health, making crime not only rare, but strange and dangerous--and the only "safe" job for a person on the borderline is as a cop...kept on a virtual leash as they hunt down the criminals they may soon become themselves! How did rice, once sacred to Japan, become its forbidden food? Division 3 descends into the deepest levels of the Special Sector in search of a lost field under a hidden sun...and the mysterious woman at the heart of their case, Kirika Nouzen. Other products for "PSYCHO-PASS" in "Accessories"
Other products for "PSYCHO-PASS" in "Apparel"
Other products for "PSYCHO-PASS" in "Bags"
Other products for "PSYCHO-PASS" in "Character Goods"
Other products for "PSYCHO-PASS" in "Key Chains"
Other products for "PSYCHO-PASS" in "Plush"
Other products for "PSYCHO-PASS" in "Wall Art"